Want to attend the AES show in Los Angeles and see what's new in the world of Live Sound, Studio Recording, Home Recording, Music Production, Broadcast and Streaming, Sound for Picture, Networked Audio, Game Audio or Product Development. Get your FREE AES Show exhibits plus badge at aesshow.com/141AES294 and enter promo code "141AES294". Be sure to visit RSPE at booth 821. 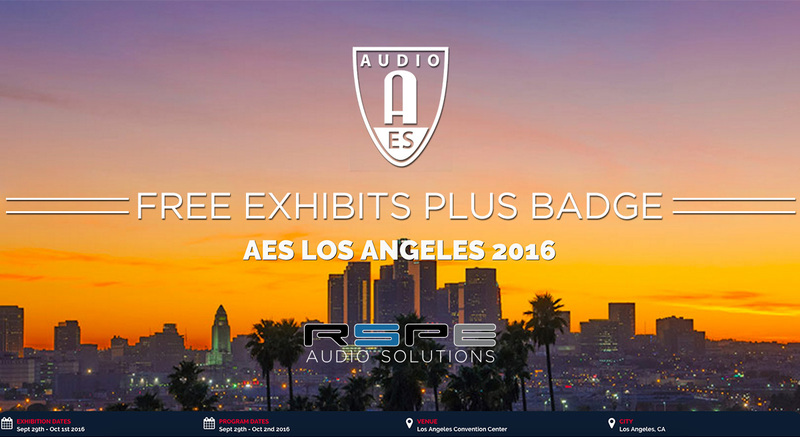 The AES Show Los Angeles 2016, takes place Sept 29 - Oct 2 at the Los Angeles Convention Center in Downtown, Los Angeles. The Free Exhibits-Plus access gains you entry to the exhibition floor and demo rooms, where leading manufacturers reveal and demonstrate the latest in audio hardware and software tools.